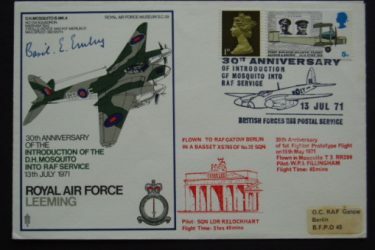 Joining the RAF in 1921, Embry had an outstanding career, retiring as Commander-in-Chief Allied Air Forces Europe in 1955. During his service he flew initially in Iraq and India rising to command a Blenheim Bomber Squadron at the outbreak of WWII. He was shot down during the Battle of France and became the first British Airman to return home after an incredible escape through France detailed in the classic book ‘Wingless Victory’. He commanded a night fighter wing during the Battle of Britain then was posted to the Desert Air Force to assist with the relief of Tobruk. He later commanded No 2 Group which was responsible for some of the most daring and well planned raids of the war, including low level precision attacks on the Gestapo HQs at Arhus, Copenhagen and Odense, and Operation Jericho against the prison at Amiens. 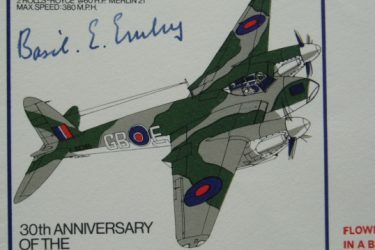 Directly after the war, he was appointed C-in-C Fighter Command, a position he held for four turbulent years. His autobiography ‘Mission Completed’ is a riveting read. After retiring, he emigrated to Australia to farm and died there in 1977.